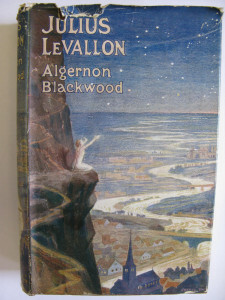 This month marks the centenary of an unusual and original novel of the supernatural, Julius Le Vallon by Algernon Blackwood, which was issued by Cassell in May 1916. I remember finding this in a little compact cinnamon-coloured book, probably the Cassell’s Pocket Library reprint of 1929, on a shelf standing by the open door, in cracked white paint, of the lobby of a bookshop in Winchester. At the time I was living in a bedsit in Southampton, and to escape from this I often went out at weekends to the old towns nearby. The ancient Saxon cathedral city was only half an hour away and a pleasure to stroll around, with its statue of King Alfred, cathedral and half-timbered buildings. Above the city was St Catherine’s Hill, with its turf maze carved into the green slopes (I was then researching and exploring these curious antiquities), and along the river the chapel and medieval hospital (almshouse) of St Cross. I associate the finding of the copy of Julius Le Vallon with pale sunlight and some first hesitant warmth, so it was probably in Spring. I remember the great delight of the discovery because, although Blackwood’s stories were fairly easy to get in various collections and omnibus volumes, the novels were much harder, and I rarely saw them. I am sure I took it back to the green armchair with its snagged threads, thin flat cushion and long worn wooden arms, and started reading straightaway. The book reminded me quite a lot of Herman Hesse’s Demian, then a favourite of mine, and also a wartime novel. They were both about youth in the quest for the visionary and unearthly, which is how I liked to think of myself then. I have been rereading and thinking about Julius Le Vallon fairly recently, as I tried to write a longish story involving a form of reincarnation, but in a different, less deterministic way than it is often presented in older fiction. This is due out shortly in Pagan Triptych from Sarob Press, along with other Blackwood-inspired long stories by John Howard and Ron Weighell. It seems to me that in this and Blackwood’s other major “reincarnation” works, what he is actually writing about is the attempt to channel a cosmic power. His books have characters who are indeed reborn versions of previous figures involved in such experiments, but they are not from the historical past, so much as from other dimensions. The two main protagonists of Blackwood’s book meet as schoolboys and recognise their mutual destiny, and he does well to balance their mystical adventures with the minutiae of ordinary school life. Later, though, he introduces a love triangle with a young woman also from their cosmic past, and I think he struggles to make these relationships quite as convincing. His characters are rather solemn, and sometimes speak portentously, and the book occasionally gets a bit weighed down. Even so, there is no mistaking the ardour of Blackwood’s beliefs about unearthly powers, and his novel must certainly have been among the strangest and most original books to appear in those dreadful days of war one hundred years ago. It has certainly remained a talisman for me, a remembrance of a minor wonder, found when I needed it most. I like stories behind the story and you paint a vivid picture surrounding your discovery of this book, bringing life to the review, Mark. I have already ordered the Sarob title, but readers who have yet to take plunge, should easily be persuaded by your heartfelt words. This, along with THE CENTAUR, is on my to-read list, as I am familiar with the Edinburgh and Midlothian locales that Blackwood describes in the book. I have the very same edition. Mine's inscribed, 'Jill A. Balcon, 25.XI.44,' so, presumably, belonged to the late widow of film producer, Michael. Since I too was living in Southampton and also often wandered around Winchester, it wouldn't surprise me if it was the same copy!